I love living in the city. I’m a city girl. I’ve lived in the country, but I much prefer to be able to walk to the 7-11, even in the middle of the night, if needed, for milk, if I’m out. The pedestrian lifestyle I’m able to live downtown rocks. However, every once in a while, it’s also awesome to get out of the city, away from the sirens and the constant honking of horns. This past week, I’ve been staying at a boat-access only cabin on Ruby Lake on the Sunshine Coast. This means many things; no showers, no dishwasher, no flush toilets. A rustic kitchen. And… a Barbecue! BBQ is something I love, but I seldom get to do. In my tiny downtown apartment, we have a balcony only big enough for the door to swing open. There’s no room for even a tiny BBQ out there, so I have to limit my grilling to times when I have access. To make up for it, this week I’ve been grilling all the things! And I’m excited to share some of them with you. First off, we picked up Okanagan Peaches on our way home from Vernon last week. These are pretty much the best peaches you’ve ever had in your life—large, juicy, tree-ripened. They taste like summer. We had a beautiful peach gelato at the Smoke ’n’ Oak Bistro at Wild Goose in Okanagan Falls, and I want to try to make that next, but sadly my ice cream maker won’t run at the cabin. Instead, I decided to grill the peaches. 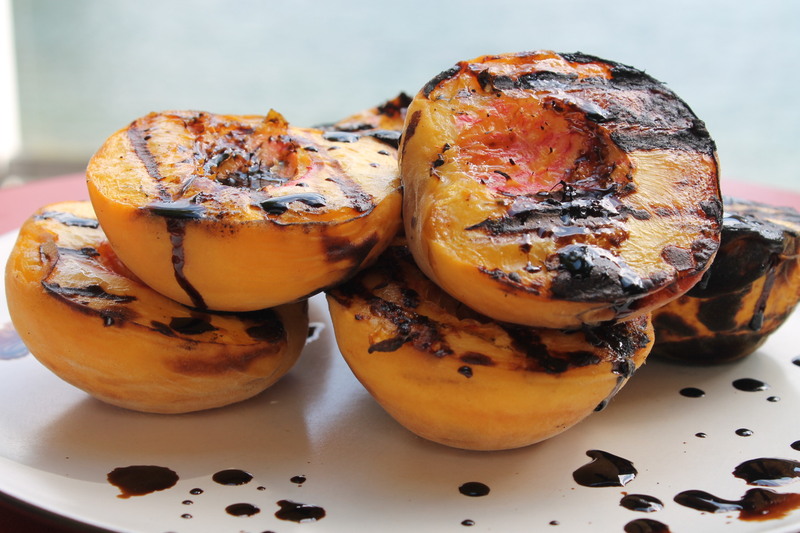 I know cooking fruit on the BBQ sounds kind of strange, but it brings out the natural sugar of the peaches. To counteract this sweetness, I served them with a balsamic syrup. You could also add a dollop of whipped cream. We ate the leftovers for dessert last night, wrapped up in crepes with nutella and whipped cream. They were quite the hit! 1 cup balsamic vinegar, slowly simmered over a low heat for about 15 minutes, until reduced by at least half, and syrupy in consistency (I used a chocolate-infused one for extra sweetness). You could also buy a pre-made balsamic reduction. Heat the BBQ up to about 300 degrees. Cut the peaches in half, length-wise, and remove the stone. 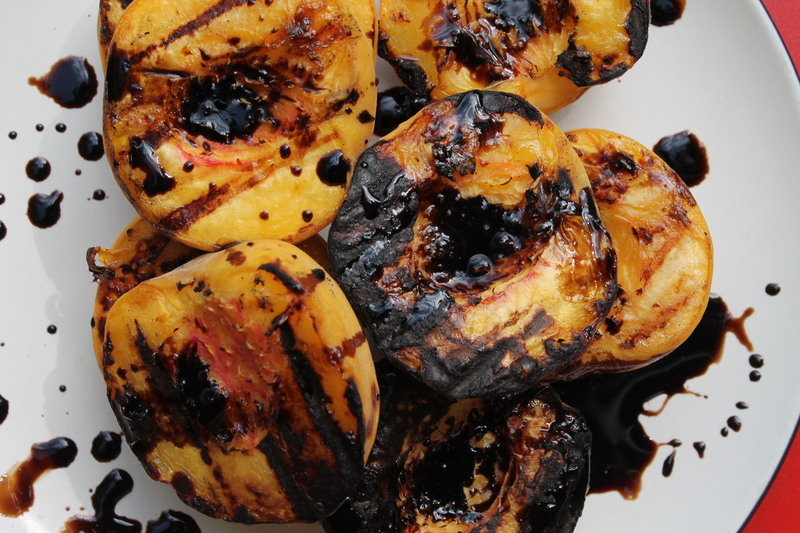 Brush the cut side of the peaches with melted butter or olive oil, to keep them from sticking to the grill. Place, cut-side down on the BBQ, and then close the lid. Allow to grill fro about 5-10 minutes. You want nice grill marks on them. Turn the peaches over, close the lid, and allow to cook for another 5 minutes. Remove, plate, and drizzle with balsamic reduction before serving. I love the element of surprise in a recipe. One tiny little thing that’s done differently–unexpectedly–that has a huge impact. In this particular case, it’s not just including fruit on a salad (because fruits and veggies are cousins, and they taste great together), it’s grilling the fruit before putting it on the salad. Roasting the peaches on the stove brings forth the natural sugars and gives them some lovely caramelization. 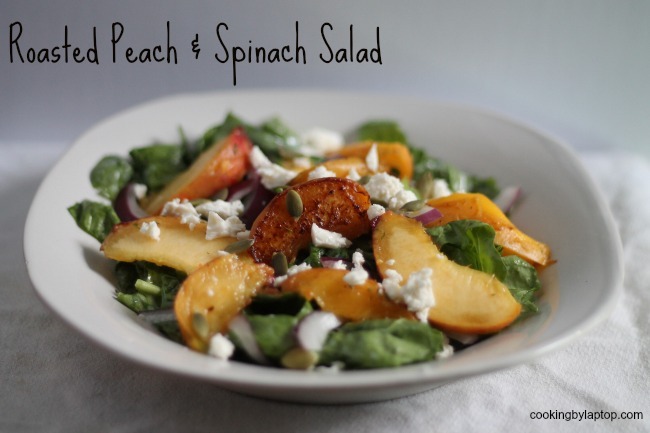 They add a beautiful, sweet, rich element to this simple salad. You could, by the way, also do the peaches on the BBQ. Over a medium heat in a cast-iron frying pan, heat a little olive oil. Place the peaches cut-side down in the hot oil, and allow them to fry until you get some nice brown caramelization. Remove to a plate until ready to serve. Wash and spin dry the spinach. Place in a large bowl and toss with the raspberry vinagrette. Place a handful of spinach on a plate. Top with a few onion slices. Cut the peach halves into slices, and distribute them on the plate. Sprinkle over some crumbled feta, and finish with a sprinkling of nuts. Serves 4 as an appetizer, or 2 as a main.